What is diamond fluorescence? Is it good or bad? Should you buy (or not buy) a diamond because of it? Here’s what you need to know about diamond fluorescence and it’s effect on the value of your diamond. Have you ever seen how some fabrics and objects glow under black light? Fluorescence is the glow you sometimes see when an object emits visible light under the non-visible rays of ultraviolet light. There’s ultraviolet light in sunlight too but sunlight is so bright it almost always outshines the faint effect of fluorescence. About 35% of diamonds fluoresce when they are exposed to ultraviolet light. Once the UV light source is removed, the diamond stops fluorescing. You’ll often see figures much higher but this statistic is based on a study of a random sample of 26,010 diamonds graded by GIA in 1997: 65% had no reported fluorescence. GIA tests for diamond fluorescence using 365nm longwave ultraviolet light. On GIA certificates, fluorescence is included as an identifying characteristic, not as a grading factor like the 4Cs. GIA certificates describe fluorescence by its intensity: None, Faint, Medium, Strong and Very Strong when compared to master stones used in the lab. If the fluorescence is Medium, Strong, or Very Strong, the color of the fluorescence will also be noted. So far, so good. But diamond fluorescence gets a little more complex because it sometimes affects either a diamond’s color or its clarity in non-lab conditions like direct sunlight. That can affect a diamond’s market value. Diamonds with very strong fluorescence may in rare cases appear to have a hazy or oily appearance. As a result, colorless to near colorless diamonds with strong to very strong fluorescence sell at a discount. Conversely, in bright sunshine some slightly yellow diamonds with a strong blue fluorescence may appear more colorless. As a result, near colorless to faint yellow diamonds with a very strong to medium bluish fluorescence may have a slightly higher per carat price than similar diamonds that do not fluoresce. These price differences exist whether of not the diamonds actually show any visible change due to fluorescence: they are based on risk and possibilities not reality. 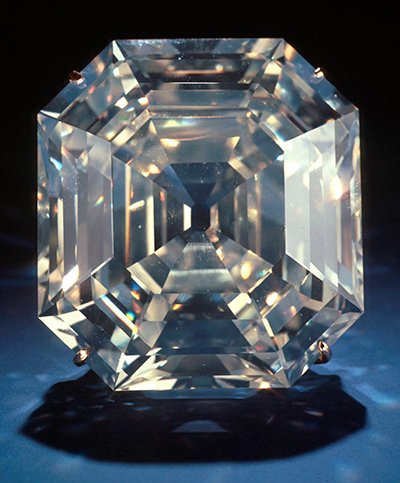 The most famous fluorescent diamond is the Portuguese Diamond in the Smithsonian, a beautiful 127-carat fluorescent diamond. In 1997, GIA graded the Portuguese Diamond as M VS1, with very strong blue fluorescence. The apparent cloudiness in the stone is actually fluorescence that is so intense it is visible even in daylight or incandescent light. The Portuguese Diamond shows both of the possible effects of diamond fluorescence in one gem: one negative and one positive. First, its fluorescence is so strong has a hazy glow in daylight and even in incandescent light. Second, thanks to its blue fluorescence it appears much whiter than you would expect from its color grade. How likely are you to see either a positive or negative effect from fluorescence in your diamond? The GIA study showed diamonds with and without fluorescence to diamond professionals and average consumers to test whether people could see differences in color or clarity due to fluorescence. A small percentage of diamond professionals saw differences, positive and negative. The average consumers didn’t see any effect on the appearance of the diamonds due to fluorescence. For the most part the prejudice against fluorescence is based on risk rather than reality. Despite the results of the 1997 study, most of the trade continues to penalize fine colorless diamonds and reward lower color diamonds for fluorescence. Because of all the uncertainty around fluorescence causing haziness in sunlight, ROSI generally will not recommend any diamonds with fluorescence above medium. The exception is clients who are looking for investment quality diamond like a D IF. In those cases, we recommend none to faint fluorescence to make sure these premium gems hold their value. ROSI doesn’t recommend paying a premium for strong fluorescence in I and J color diamonds because in most cases you won’t see a beneficial effect on color.